It is hard to say who is enjoying this more! Floss not good enough for you? @TN: Probably not the creature whose head is being sliced in two with the crystalline sword. 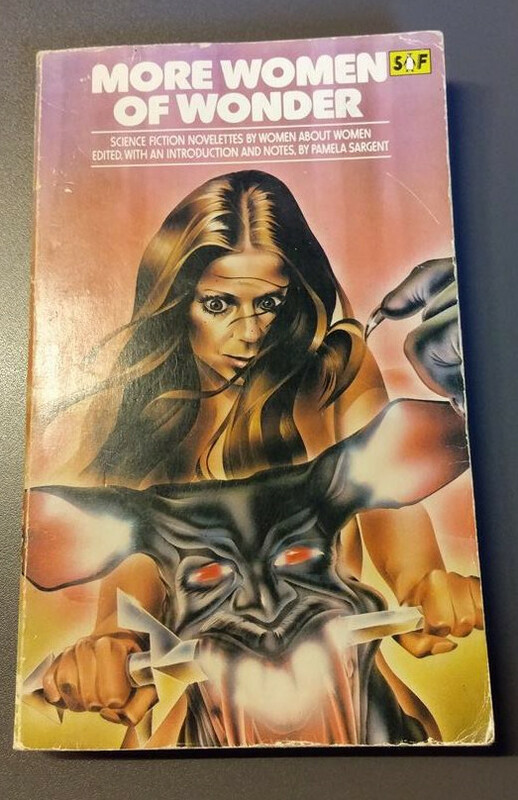 because nothing appeals to women sci-fi readers like a demon bmx reminding you you need a manicure! And, yay, GSS is back! In the original draft of the script, Leia was supposed to first kill Salacious Crumb. I want to know whose hand that is at middle-right. Bet he’s regretting his poor enunciation when he said he was begging for a Cree torch! The clawed hand from the off-scene Player 1 and the way the Sara Kestleman lookalike’s apparently reading something written behind the cat’s right ear suggest a gargoyle edition novelty Wii handset. Is this another gem from Adrian ‘I Gotta Air-Brush And I’m Gonna Use It’ Chesterman? Yeah, first thing I’m thinking is’handlebars’ and is that Rat Fink she’s riding? Where’s MotorMutt! Then I made the mistake of looking into her eyes. Must have book now… must know secrets of… Women of Wonder..
Logic dictates that Wonder Woman is a woman of wonder, however this does not entail all women of wonder are Wonder Women. Am I the only one who thinks the demon’s mustache makes you think of Walt Disney? @Tag Wizard: Where’s the “starkers” tag on this? Because, seriously, take a look – the woman’s naked. And WHAT is going on with her hair? Because nothing makes one think “Science Fiction by women, about women” like a naked Sword & Sorcery woman skewering a giant rat.